July 27, 2015 September 30, 2015 / Elizabeth T.
In the recent years, the BB and CC Creams trend has been taking over the international beauty industry by storm, and with its newfound global popularity, many brands have come up with their own versions of the magical balms that consists of foundation plus concealer plus skincare plus sunscreen (and the list goes on). While CC boasts color correcting properties, I much prefer BB Creams since they’re more focused on concealing as well as healing blemishes. Having adopted the BB Cream trend long before it even actually a thing in America, I’m still a big fan of the original Korean products because I feel that they are more suited for my skin (in both skin tone and skincare needs), while the American versions (such as those produced by Olay, Garnier, etc) act more as tinted moisturizers. After using many BB Creams over the years, I’ve come down to four that I still keep in my makeup stash, and it’s these four products that I keep coming back to, time and time again. 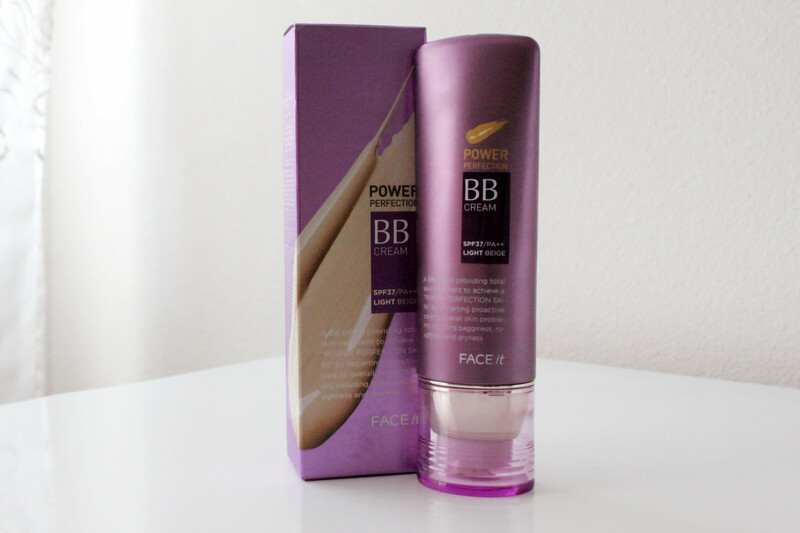 My least favorite out of all of the ones that I have, the Face Shop’s Face It Power Perfect BB Cream acts more as a foundation than a BB Cream since it offers a really high coverage (more than any BB Cream that I’ve ever tried). And while high coverage is a good thing (at least for some), I don’t really like thick it feels on my skin because I typically don’t need that much coverage. However, I do keep this in my makeup drawer because my mom seems to really like this one since it has a good amount of SPF (37), and of course, who could resist the boy-next-door-charm’s of the forever-fresh-faced Kim Hyun Joong and Asia’s newest heartthrob Kim Soo Hyun? Love the packaging though, which gives this a total of 3 out of 5 stars! 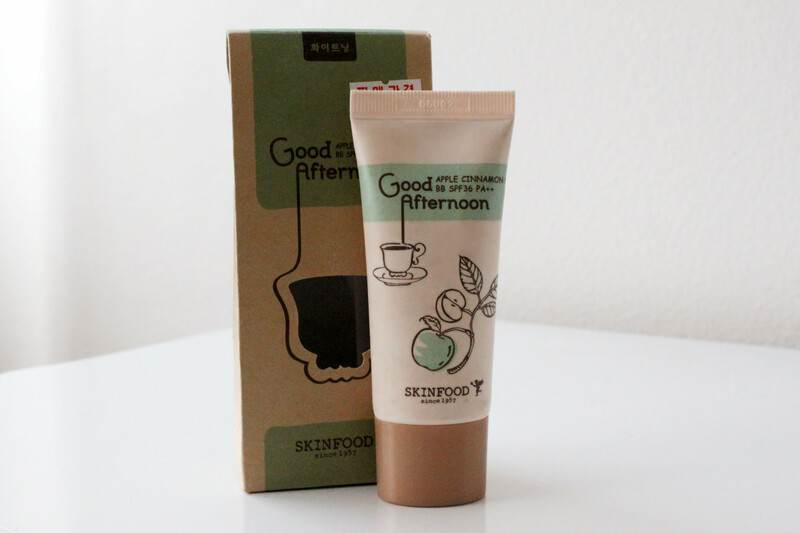 Coming in third is Skinfood’s Good Afternoon Apple Cinnamon Tea BB Cream. I absolutely love the way this BB Cream smells because it’s really like an afternoon sipping sweet tea under the sun. The sweet apple scent and the perfect addition of just a dash of savory cinnamon makes this BB Cream act almost as aromatherapy in itself. With medium coverage and easy application, this BB Cream dries matte and offers the perfect off-day makeup look. I typically wear this when I go to school because it’s light and looks super natural. The only downside is that it doesn’t last super long, getting just a tiny bit cakey about six hours into its wear. However, for those who are just beginning to experiment with makeup, I really recommend this BB Cream because it’s lightweight, offers decent coverage, smells wonderful, and looks very natural. That’s why this BB Cream gets a 3.5 out of 5 stars! 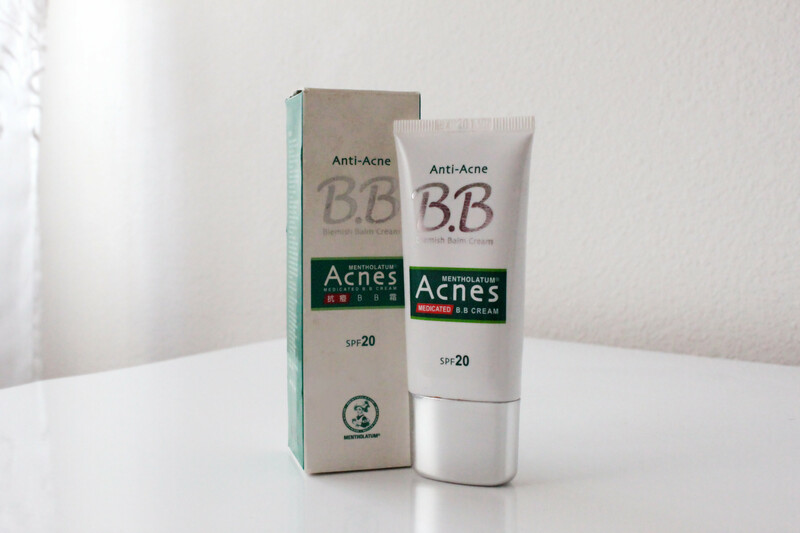 My second favorite BB Cream is the Mentholatum Anti-Acne BB Cream. This BB Cream is a life saver, especially for those with acne scars or pimples because this formula is actually infused with salicylic acid and skin whitening properties that help heal your skin even as you’re wearing makeup. With this BB Cream, I’ve noticed that if I apply it to a pimple, it is definitely less red by the end of the day. Also, if I popped a pimple the night before, but have to wear makeup for an event the next day, this BB Cream does such a good job of healing the damaged skin, leaving minimal scarring. With a lightweight formula and watery texture, this BB Cream still offers such amazing coverage, but at the same time, lets skin breath and heal. Over the years, I’ve come back to this BB Cream time and time again because it really works so well! Now that I’m in my twenties, though, I don’t break out as often, but I still keep it this BB Cream in my makeup collection, using it only when I have a really stubborn break out. Rather than applying it to my whole face like I used to, now I just use a bit to act as a concealer/spot treatment for my blemish 🙂 And every time after I’ve done this, I’ve noticed that my pimple does in fact become smaller and less red. Only downside, Mentholatum’s BB Cream only comes in one shade, which is a little bit darker than my natural skin tone (which is why this actually works better for me as a concealer/spot treatment vs. as an actually full face BB Cream). But since there are other things about it that are so good, Mentholatum gets a 3.8 out of 5 stars! This BB Cream is very buildable, offering a light to medium coverage. For lazy days, I just use a bit and pat it all over my face, but if I’m using this for a more important event, I typically just build up the coverage for a very natural look. The best thing about this BB Cream is the fact that it really helps moisturize the skin while you’re wearing makeup. For me, dry skin is one of my top concerns, and I’ve noticed with a lot of foundations and even BB Creams that the makeup tends to not last long, either caking or flaking throughout the day due to my dry skin. The only downside of this BB Cream is that it only comes in one color, but it works fine for me, since its color actually matches my skin tone perfectly. However, for some of you with more olive or tanned skin, this might be a little too light. 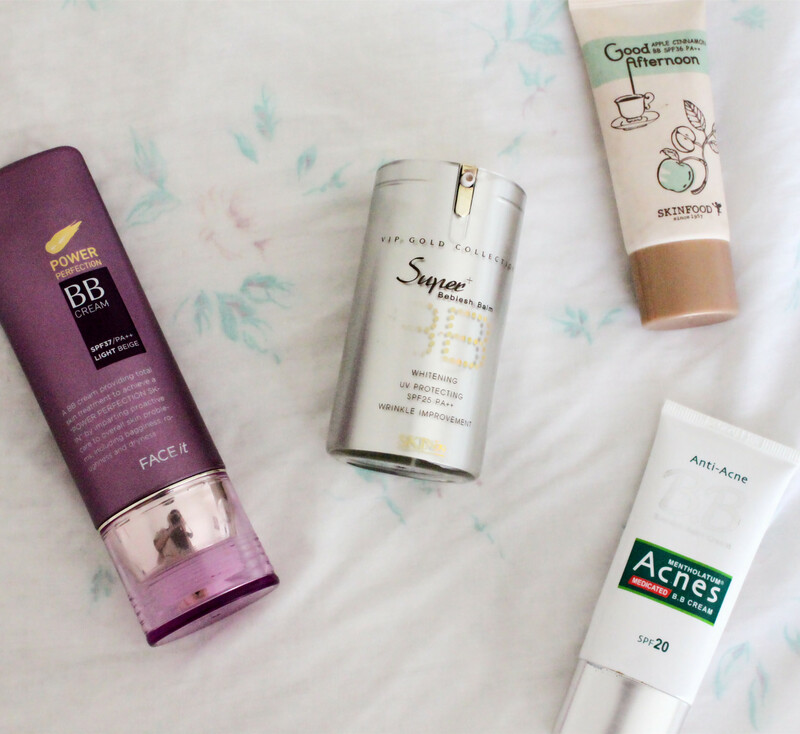 I hope you all enjoyed this little BB Cream review! 🙂 What do you all think about BB Creams? Or do you prefer CC? Or foundation? Let me know in the comments below because I’m always up to try new and amazing products! Note: All products mentioned in this post were purchased by me and were in no way sponsored by these brands. Wow thank you so very much for this post!! Definitely going to try skin food! Thanks this is a great post! Love BB cream, Thanks for sharing your favorites. 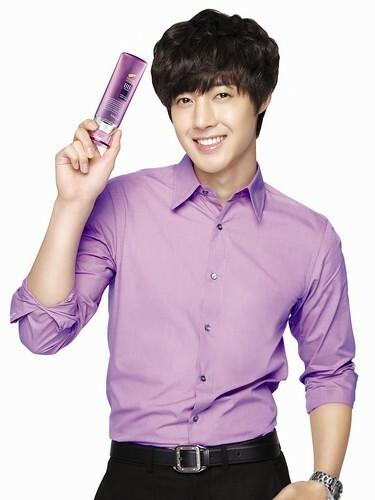 Haha that’s my favorite BB cream too! I think I will try BB cream this Summer!